Telegram Messenger which is started in 2013 as a most capable competitor to whatsApp. 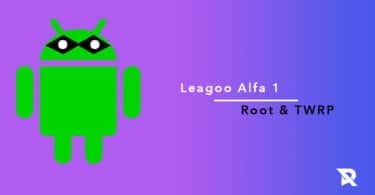 It is the cloud-based app with end-to-end encryption of messages, in short words, this app is mainly focused on user privacy. The company recently celebrated a milestone of 100+ million active users, but it is nowhere WhatsApp’s one billion users. 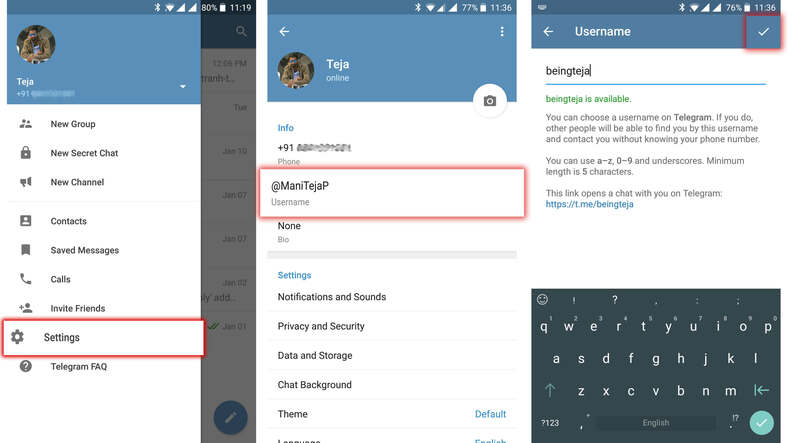 Anyhow, Telegram has the range of unique features that may not be as evident for every user. For a new user, it will be quite hard until they know some cool Telegram Messenger App tricks. So, here we have compiled 15 cool Telegram Messenger tricks which help you to make the most out of Telegram. Lock screen notifications and message previews are quite cool and useful features, at the same time they allow anyone to see your personal messages. 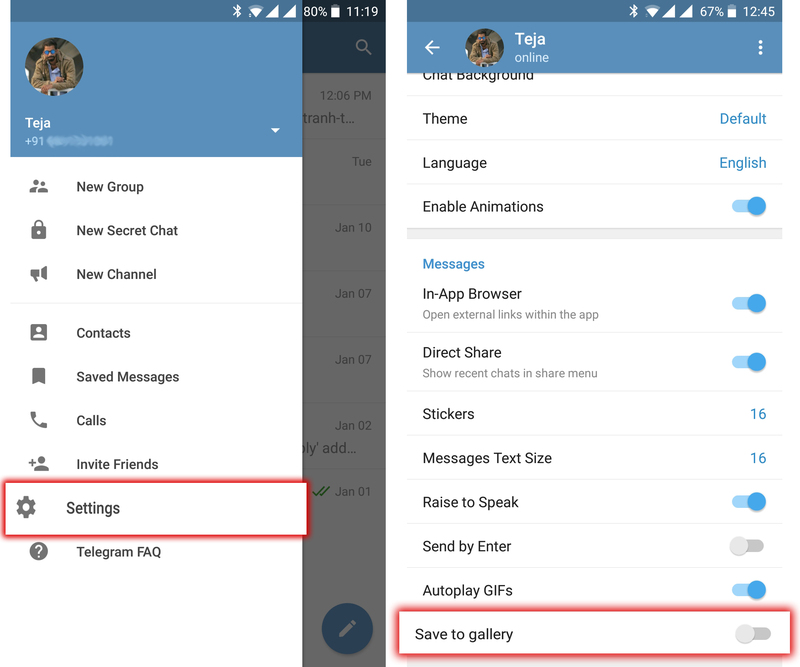 But, as we said Telegram is mainly focused on users privacy, it has the option to disable message previews. Simply navigate to Settings -> Notification and Sounds -> turn off Message Preview. 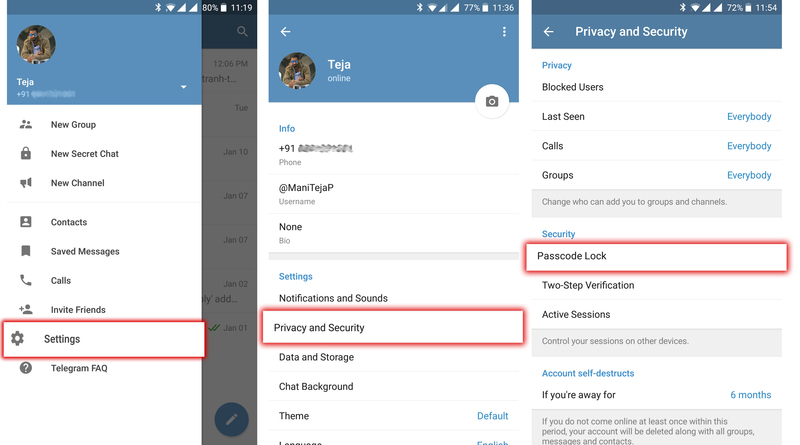 When you don’t want to share your mobile number linked to Telegram or you don’t want your real name to appear then you can just share or change your unique username and your phone number will always be private. To change your username go into the Settings -> tap on Username -> Change and save. Most of the Android devices have the built-in notification LED with multiple colors. 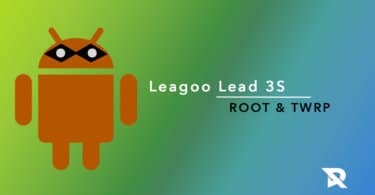 But Android does not give you the freedom to set custom LED notification colors, you have to install the third-party app to do that. Telegram is one of the apps lets you set a custom notification color for individual contact. 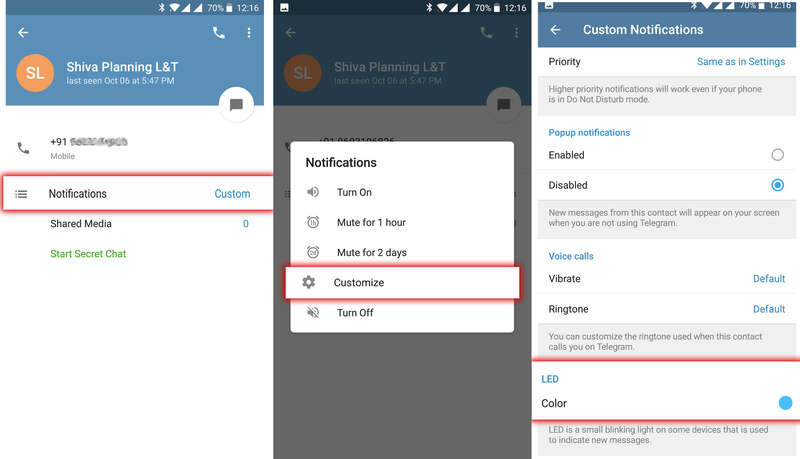 For custom notification, go to contact’s info -> Notifications -> Customize, here you will find the options to change notifications, vibrate pattern, sound, contact’s priority and LED color. As we all know that pop-up notifications are very disturbing and annoying, but if you are an ardent texter this feature comes in handy, as you can directly reply from your homescreen. To enable pop-up notifications in Settings -> Notifications and Sounds -> Popup Notifications and select Always show popup or Only when screen on or off. Always show option sends you the chat popup even when your device is locked. It’s quite tricky to look for an old message in long chat, end up in lot of scrolling. This search feature in Telegram makes it easy to search for the message within the chat. To search for the message tap on any contact or group chat and tap on the three-dot button and select “Search”. This will open the keyboard, enter the terms you want to search and tap on the search button. You will find the highlighted text searched for. Telegram allows users to send any file which can weigh up to 1.5 GB in size. 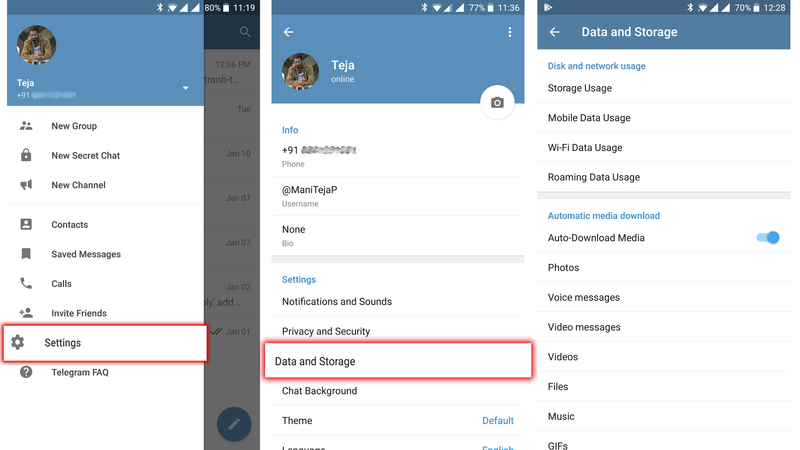 By default, Telegram sets auto download media (photos, voice, music, GIF) on both Wifi and mobile data. Change the auto download media settings if you don’t want your mobile data to get exhausted or fill up our device storage quickly. Go to settings -> Data and Storage -> Automatic media download. 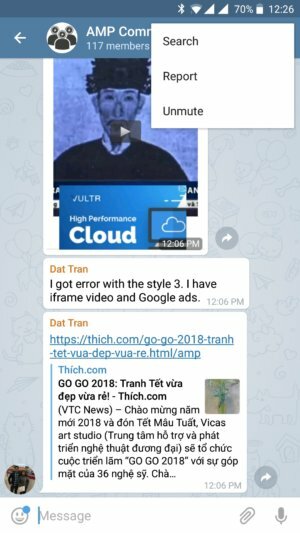 As we all know Snapchat’s self-destruct feature, similarly in Telegram’s “Secret chats” where your chats will get self-destruct. The user can also set the self-destruct timer on secret chat messages. To set the self-destruct timer in secret chat, tap on the three-dot menu button and select “Set self-destruct timer”. Set the time between 1 second to 1 week after which messages will get self-destruct. This is one of the most loved features most users wanted in messaging apps. And this is one of the cool features in Telegram app which lets you lock your chats to stop someone read your chat logs. To set the lock, go to Settings -> Privacy and Security -> Passcode Lock and enable it, set the passcode. Then set the auto-lock time, which will auto lock the chats after some amount of time. And you can also tap the lock button on the homepage to lock the chats. To hide last seen for particular users go to Telegram’s Settings -> Privacy and Security -> Last Seen. Now, set your last seen to “Everybody” or “Contacts” or “Nobody” or add exceptions. If you want to keep the photos or videos secret which is shared with you in Telegram? You can hide them easily. On iPhone -Go to Phone Settings -> Privacy -> Photos and disable Telegram. Maybe this list is not over yet, as most of the tricks list not fully complete. If you know any telegram trick which is isn’t listed here, let us know in the comment section below.